This past week my boys been on spring break so we decided to take a quick road trip to Tennessee and Alabama. The road trip was fun and we saw some great sites. Raccoon Mountain, Cathedral Caverns, Russell Cave National Monument and Little River Canyon National Preserve. Whenever we road trip my husband does most of the driving. This gives me lots of crochet time. This is good because as mentioned in my last post, Pat, with 12 months = 24 hats challenged me to hat-off. We are competing to see who can make more hats for Halos of Hope this month. In addition to hats, I’m making bears for Team Lewis. Lots to crochet in April! 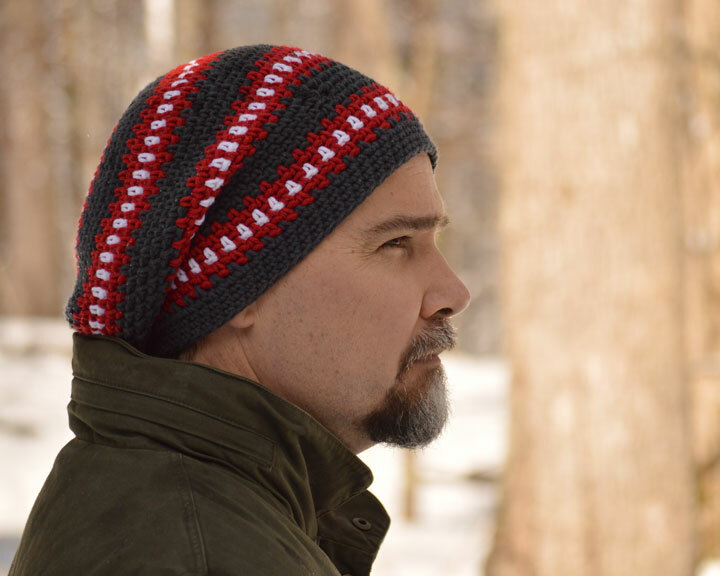 I decided to make a Cubed Hat as my first hat for this challenge as my husband wears his Cubed Super Slouchy a lot and I thought it would be nice to make one for donation. Halos of Hope always seems to need hats for men. My intent was to make a Cubed Hat, Super Slouchy but apparently I picked up the pattern for the Cubed Hat, Relaxed Beanie! Whoops! About 80% into the hat I realized I was making a beanie. Oh well. The good thing about this error was I had enough green yarn to make a second beanie. I used the same pattern but adjusted the striping. My husband really liked the color combination so it looks like I’ll be making him one as well. The bears are a lot of fun to make. Team Lewis is a sweet organization, please check it out. It’s been a busy month so far! The two hats and three bears weigh 12.25 ounces. Total weight of yarn used in the 2015 Stash Bust Challenge to date: 1 pound, 4.5 ounces! This entry was posted in 2015 Chemo Hat Challenge, Charitable Crochet, General Interest and tagged Atlanta, baby, boy, charity, chemo, child, craft, crochet, crochet pattern, crochet patterns for, designer, Halos of Hope, handmade, hat, knit, love, mens crochet hats, patterns for chemo hats, patterns for donations, patterns for stash busting, Ravelry, teen, winter, yarn. Bookmark the permalink.